How to verify if I am getting the home page HTTP response data correctly? 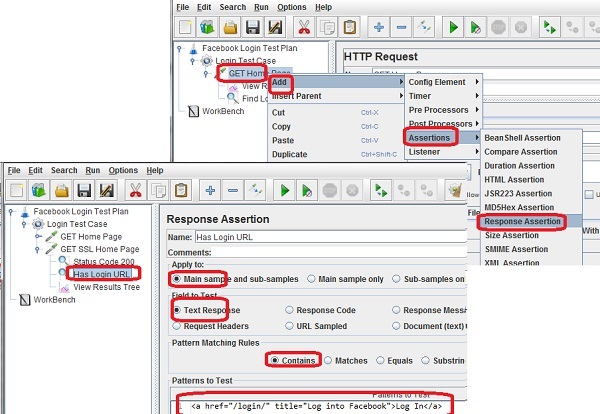 You can add several Response Assertions to the HTTP request to very if you are getting the home page HTTP response data correctly or not as shown in this tutorial. 1. Start JMeter on your computer and open "\fyicenter\Facebook-Login-Test.jmx". 3. Right-click on the "GET SSL Home Page" HTTP Request sampler, and select "Add > Assertion > Response Assertion". You see the "Response Assertion" settings screen. 6. Add a child "View Result Tree" listener to "GET SSL Home Page". 7. Click "File > Save Test Plan As" menu and save it as "\fyicenter\Facebook-Login-Test-2.jmx". 8. Click "Run > Start" menu to run the test. 9. Click "View Result Tree" in the left panel to open it. You see the "GET SSL Home Page" test sampler executed successfully. We can assume that it returned the status code 200 and the response contains the login hyper link.